I'm not a HUGE ice cream lover, but be honest - who doesn't love ice cream?! No one, that's who! Mom Central recently hooked me up with a review for Breyers Smooth and Dreamy products and I had to get down with this review - Breyers is THE only ice cream I will eat! I'm picky, what can I say?! I'm a mom and of course, my kids love ice cream! Even if I don't eat it alot, they'd eat it three times a day if I'd let them! I will let them eat it for dessert, after dinner. We usually have two containers of ice cream in the freezer at any time! Naturally, I received my coupons and off we went to our local grocery store to find these awesome products! Luckily when I went to ShopRite, the Smooth and Dreamy line was on sale, so that was awesome! I picked up the Chocolate Caramel Brownie Ice Cream Sandwiches, which you can view below. The best thing about the Smooth and Dreamy line? All of the items (6 different varieties!) 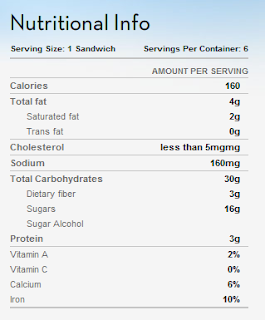 have no artificial flavors or colors, 160 calories or less and 4-6g of fat per serving! Next I'm going to have to try the Chocolate Covered Strawberry Ice Cream bars, and who knows what will be next after that?! To me, this is total awesomeness! The sodium's a little high, but the fat content is ideal, and I love that there's a few essential ingredients in there! Mom Central sent me a few coupons to give away to my readers, so I'm offering up one to a few lucky readers! Say it in unison, "Thank you Mom Central and Breyers!" Three of you will win a coupon for a FREE Smooth and Dreamy product! This giveaway will end on August 10th, 2010, at noon EST. I will be emailing the winners, so please leave your email address in your comment! 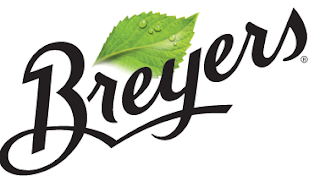 Disclaimer: I wrote this review while participating in a blog tour campaign by Mom Central on behalf of Breyers and received products necessary to facilitate my review. In addition, I received a gift certificate to thank me for taking the time to participate. My indulgence is a bowl of ice cream after dinner..usually with a little chocolate syrup on it! Thanks for the review and giveaway! Reading before bed is vital to my sanity!! I entered the BallPark giveaway! Every now and then I love a Blizzard! In the summer its the best! I entered your Dole gveaway. My indulgence would be to just kick back after the kids and hubby are asleep and watch one of my shows or read a good book! It doesn't happen that often though! I entered your Ballpark giveaway! I just luv ice cream. I love to sit down with a good movie and a bowl of ice cream then after the ice cream is all gone I go too the pop corn. My favorite indulgence is slipping into a quiet corner and reading. I entered your Dole frozen fruit giveaway. I typically indulge in desert. I enjoy having something sweet after dinner, but i also try to be smart about my choices so I think the chance to try out Breyers Smooth and Dreamy would be great! My favorite indulgence is to get a nice glass of white wine and sit a knit for a bit....so relaxing! I entered your Zuvo giveaway. My indulgence is eating a milk chocolate bar. I fit a lil chocolate every day into my diet. Once my kids are down for a nap, I take a few minutes to sit down with a good book. cdziuba@aol.com I make a cup of Hot Chai, get my cat, and I sit quietly with her while I just sit! I don't read or do anything else, it's great. I indulge in a manicure once every month or two! Taking an afternoon break to read and have a cup of tea is a frequent indulgence. I indulge by having a large glass of iced tea with crushed ice. I relax by having a glass of wine and snuggling up on the sofa! My indulgence is that I make cookies for my kids on weekends so I can eat a spoonful of cookie dough! chocolate - for sure! jut bought some of this brand in vanilla for hubby's party today and everyone loved it! Fresh fruit and time in the garden is my ultimate indulgence. Every once in a while I eat a bowel of ice cream! I try to sneak in some time to do a crossword puzzle. I indulge myself with tea and gourmet coffee, thanks. I entered the Zuvo water system giveaway, thanks. I indulge by playing on the internet in the morning. I entered the $25 Walmart g.c. giveaway. Every so often, I like to indulge with an ice cream. To indulge I go to the spa for a massage. I curl up with a good book! I entered the cats and dogs giveaway! It used to be sleep - taking a nap on Saturday my husbands day off - he works 12 hours a day six days -which kinda makes me a single mom... but he just got a WII and my little one is entertained just watching mama bike, hula etc on screen! I have a massage once a month. Every mother needs to indulge a little. A bowl of ice cream with chocolate syrup one night a week is probably my biggest indulgence. baking a pie, cookies, cakes makes me relax and unwind. I indulge with a glass of red wine some nights after everyone is in bed. It's me time-- catch up on some reading and relax. I indulge in listening to music and going to live concerts. I always have a mid-afternoon snack. Just a little something sweet that I don't have to share with anyone. I entered the Wal-Mart/BoxTops giveaway. I take a nice hot shower and indulge in a chocolatey dessert! I have to have chocolate. I just do. Every day. Sometimes a little. Sometimes a lot. Usually more than I prolly should! I take a hot bath. I entered the penguins giveaway. I buy myself a romance novel about twice a month and its a great way to relax and escape a little. I indulge by getting a pedicure once in a while. I like taking a bath and enjoying a bowl of Ice Cream while im in there. 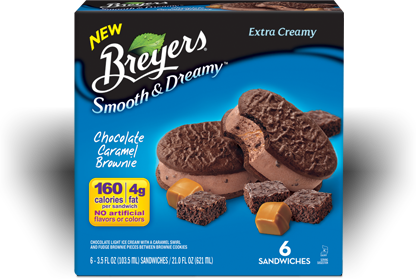 I love to have one of the Weight Watchers Ice Cream sandwiches every night they taste wonderful and are a great treat so I would love to try these Breyers products! A little way I indulge myself every once in a while is to treat myself to lunch at Panera's. Thanks for the giveaway! I enjoy a starbucks caramel machiatto on occasion. But my everyday indulgence is a piece of dark chocolate. I take an evening walk all by myself and leave the kids home with their dad. I love to slip off and take a LONG bubble bath! I indulge by eating some ice cream with fudge sauce after dinner once a week or so. I like to eat ice cream and potato chips reading a book in bed! Great way to unwind!! I indulge in reading. I love to take a little time each day to bury my nose in a book. I like to unwind in a hot bubblebath, with a good book and a glass of wine! Thanks! I endulge by spending my hour on the computer where I decompress, play games, read articles, and just have my me time. I do take a bubble bath every night and soak in the tub. My "Mommy Time" is that I get to take a BATH (it needs caps) without any interruptions. Using scented lotion and sitting in bed reading with a good drink or snack. I buy myself a fancy coffee to indulge. Hunt's is giving Moms a high five!